Yesterday in my message, I took some time to point out the fascinating parallel between the first three chapters of the Bible and the last three. In Genesis, God sets things up the way he wants it, man contaminates it and curses ensue. In Revelation, God sets in place his plan to reverse the curse and prepare a place of no more pain, no more curse, no more suffering (Rev. 21:4). The tree of life in Genesis 2 and 3 connect to the tree of life in Revelation 21 and 22. So cool! The Bible rocks! It cohesion and supernatural harmony are totally fascinating and only divine. I like the way that Mark Batterson captures this in his latest book, "Primal." The Bible was written over a span of fifteen hundred years by more than forty writers. God inspired Kings and poets and prophets and shepherds. They wrote out of very different personalities in very different circumstances. Some wrote in the plush setting of a palace, while others etched their words during an island exile. Some wrote out of the agony of personal tragedy, while others wrote in the ecstasy of epiphany. 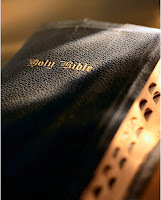 Written in three different languages on three different continents, there is no other book like the Bible. Despite the fact that it touches on thousands of complex subjects and controversial topics, it possesses a supernatural harmony from beginning to end. And it is omnirelevant to every person on the planet. Amen!! I love the word of God because it deepens my love for the God of the word! I pray that you will make it a priority to spend the time needed to get fascinated by God in his Word!